This month’s viral videos are inspirational. 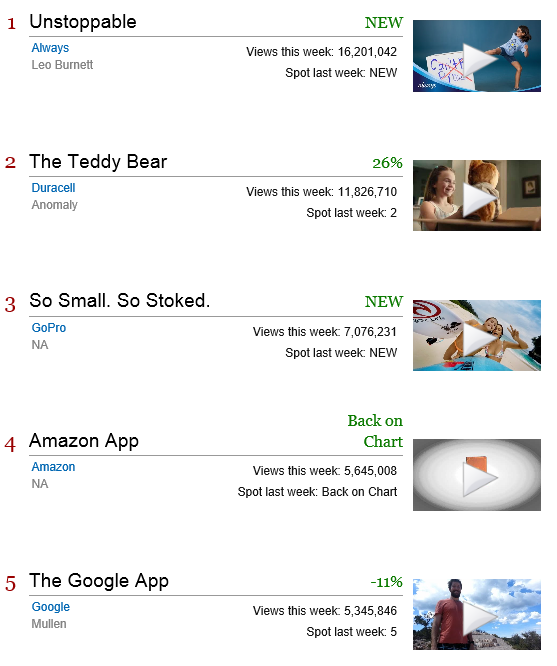 The new version of the #LikeAGirl campaign from Always’ was a fast-riser this month, rising quickly to the top of the chart with more than 16 million views. If you recall, the original campaign launched last summer to accolades and earned a Cannes Lion International award. The new campaign, “Unstoppable,” continues the theme of challenges faced by girls and young women. The world population is expected to reach 11 billion people by the end of the century. That’s a lot of people to feed, particularly since climate change is affecting agriculture crops and food supplies around the world. This leads us to consider what the alternatives are to today’s most popular protein sources of beef, pork, and chicken? Stumped? Try insects. You read that right – insects are a sustainable source of protein and food. More than 2 billion people around the world already eat bugs in countries such as Mexico, Thailand, China, and more. Insects are healthier than meat, containing more protein, cheap to raise and produce, and insects are a sustainable food source. Yet, insects are just not on most of our radar for nutrition and diet. 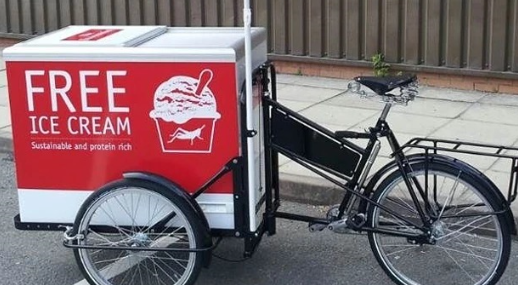 A campaign for The Economist is trying to change consumers’ perceptions about insects as nutrition (and gain new readers) by offering Londoners free ice cream in several delicious buggy flavors: Surry Berry (elderberry and raspberry mixed with insect bits), Choc Hopper (grasshopper, strawberries, swirls, mixed with meal-worms), and Nutritious Neapolitan (includes “mixed critters”). The purpose is to expose readers to the real world, in real time, by creating a experience that takes consumers outside of their usual comfort zone. Discuss sustainability issues related to feeding a growing population. Discuss cultural differences and preferences for foods. Divide students into teams and have team select a country to research about foods. In teams, have each team develop a marketing campaign for selling ice cream containing bugs in the U.S. There are an estimated 40 million people in developing countries who need wheelchairs to get around for work and home. However, many of these people live in rural areas with rough terrain and have a low income. Standard wheelchairs are expensive and are not designed for rough terrain. In a great case of innovation and design, engineers at MIT took on the problem of mobility by reworking a wheelchair design that had not been changed in more than 100 years. With the customer at the center of the design, the product requirements included a chair that cost less than $200, could navigate 5 kilometers/day of varied terrain, be usable indoors, and be repairable locally with standard bike parts. 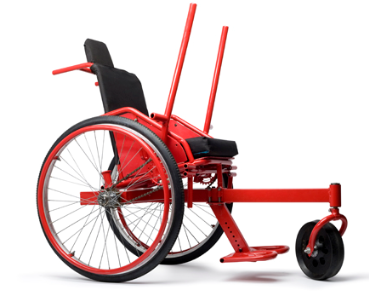 The result – a combination wheelchair and all-terrain trike. The product, Leveraged Freedom Chair, has a drivetrain made of inexpensive bike parts that are available even in remote rural areas. View the video at TED Talks to learn how this revolutionary chair was designed and produced. Discuss the process of innovation. Divide students into teams and have each team map the innovation process against the process used by the company. Have each team brainstorm on other products that could be reimagined and reengineered to meet social needs for people with disabilities.